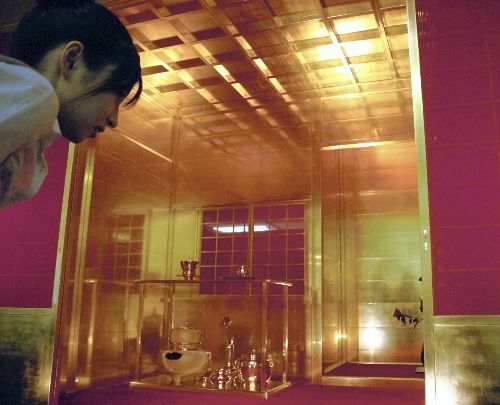 A golden tea room made with over $4 million in real gold has been mesmerizing shoppers at the Yokohama Takashimaya department store in Yokohama City. The tea room is a faithful, life-size reproduction of one used by the powerful feudal ruler Toyotomi Hideyoshi (1536–1598), who often consulted with famed tea master Sen no Rikyu on matters spiritual and military. The tea room is made with $1 million in gold leaf and over $3 million in solid-gold cups and other accoutrements. One shopper marveling at the gilded tea room commented, "I wonder what Hideyoshi thought of when he was sitting in there?" What indeed. Perhaps he thought, "Hmm, do you think I got a little carried away?" 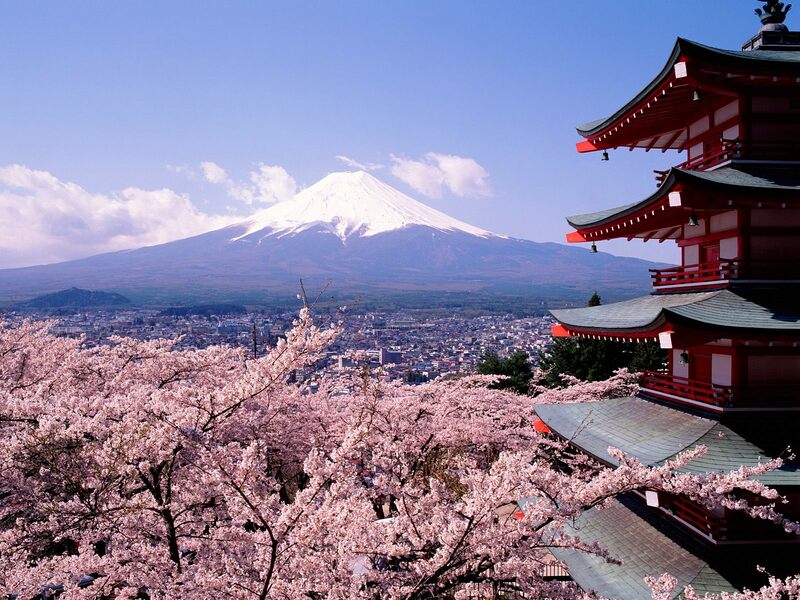 The number of people in Japan who have reached or passed the 100-year-old mark has reached record levels — and shows no signs of slowing down. Hmm, you don't all that green tea they drink has anything to do with it, do you? 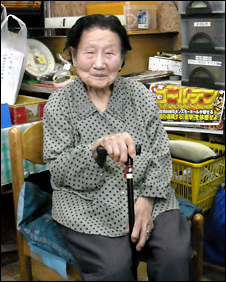 Matsu Yamazaki, 103, still works in her family's grocery shop in Tokyo. Before it was closed in 1923, the Iwami Silver Mine used to lure thousands of mine workers, but today it draws hundreds of thousands of people — as a World Heritage site (although not all locals are pleased with the designation). 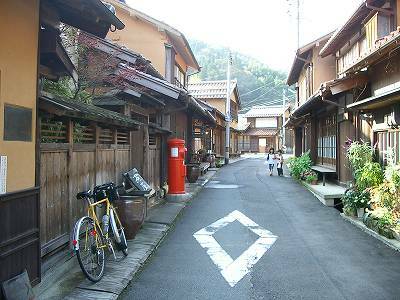 The "main street" of Omori Town, site of the now-famous silver mine. I found a collection of beautiful photos of Tokyo at twilight. Not far from Tokyo Tower (in the background), a quiet neighborhood is nestled between two lively streets. 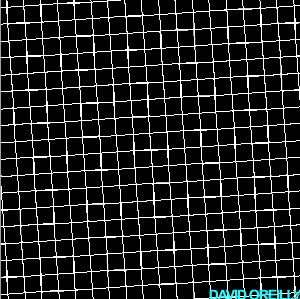 Click on the images below to mellow out to the full-sized version. 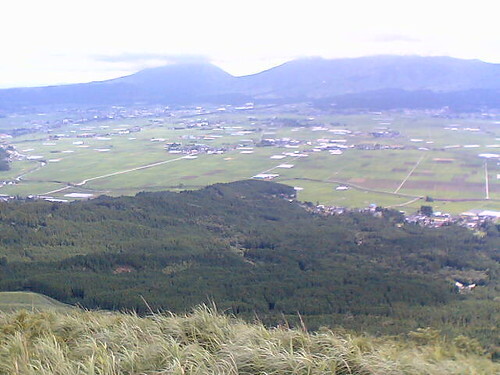 Japan's Aso region is the source of Mellow Monk's green tea and home to a wide range of natural and cultural beauty. Nestled in the hills at the north edge of the Aso valley is an important cultural heritage site, the quietly beautiful Kokuzo Shinto Shrine. 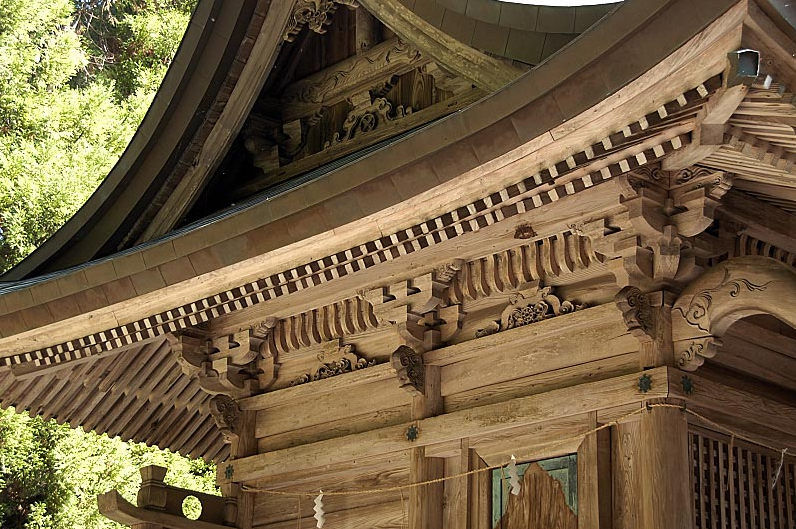 An example of the intricate woodwork of the main shrine building. A leopard hunting a baboon is unusual in and of itself. But this particular leopard is in for an even bigger surprise at the end of her hunt — and how she reacts to that surprise is simply amazing. Novak's Blog has a page of color and black-and-white photos of Hollywood celebrities in the '70s. Proof that pictures don't age as quickly as people do. Beautiful photo of Mt. Fuji — "Fuji from Afar"
Click to see the very large, super-high-resolution image in all its glory. Research done at the University of California at Los Angeles (UCLA) and reported in the journal American Psychologist delivers the devastating (to the diet industry) news: dieting does not work. "You can initially lose 5 to 10 percent of your weight on any number of diets, but then the weight comes back," said Traci Mann, UCLA associate professor of psychology and lead author of the study. "We found that the majority of people regained all the weight, plus more. Sustained weight loss was found only in a small minority of participants, while complete weight regain was found in the majority. Diets do not lead to sustained weight loss or health benefits for the majority of people." Instead, what does work is exercise and eating healthy and in moderation — and green tea can play a pivotal role in your eat-healthy-to-lose-weight strategy. Authors of the UCLA study, psychologists Traci Mann (right) and Janet Tomiyama. When you fly into the airport in Oita on the island of Kyushu, you may see an unusual sight while waiting for your suitcases to be disgorged onto the baggage carousel — the world's largest piece of sushi. Or so it seems at first glance. What it actually is, however, is a big prop advertising one of the area's culinary delicacies — uni (sea urchin) from Saiki, a town famous for its bounty from the sea. What the ... Hey, somebody get me a quart of soy sauce! Ah, I should have known it was too good to be true. Even if you can't get away right now to visit any of the world's most beautiful beaches, just gazing at these photos is enough to find relaxation. You can also get lost in these imaginary landscapes created by a very imaginative artist. Freshly brewed green tea has up to 95 percent higher levels of the antioxidant EGCG than bottled tea (2006 U.S. Department of Agriculture database of flavonoid content in foods). 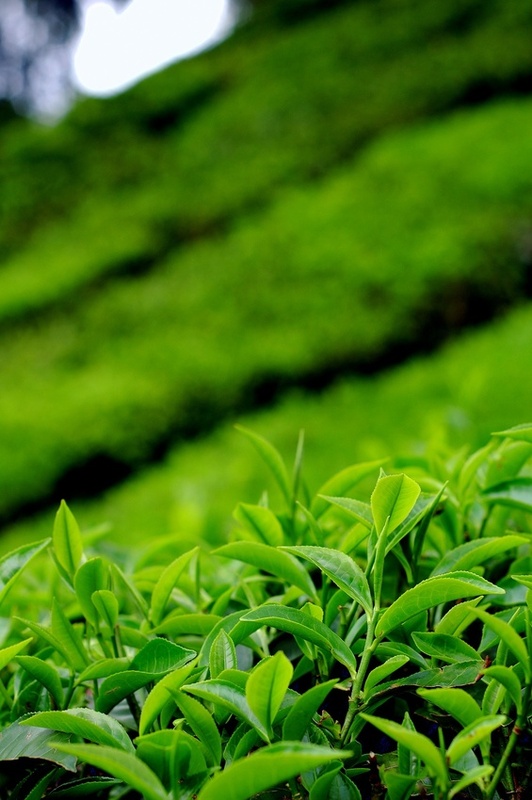 Antioxidants in green tea are sensitive to heat, oxygen, sweeteners and other additives and can easily be destroyed during processing, transportation and storage of bottled tea. Studies have shown that antioxidants help with weight loss, cholesterol, cardiovascular diseases and stress. And speaking of EGCG (epigallocatechin gallate), the many benefits of this antioxidant — which is found only in green tea — may include the ability to prevent Parkinson's and Alzheimer's disease. I've got mixed bag for you today — one artist's conception of the edge of the world, photos of a real-life kung fu-themed fast food restaurant, and a soldier's secret to maintaining perfect posture. I predict property values here will soon plummet. Here's a double feature that's perfect for browsing with a warm cup of green tea in hand on a Sunday morning: a gallery of artistically blurred photographs and pics of a mysterious wind tower in the middle of Tokyo Bay. It's actually a ventillation shaft for a rail line that runs under the bay. If you're poised to bring a beverage to your lips and it's not water, chances are, it is tea. 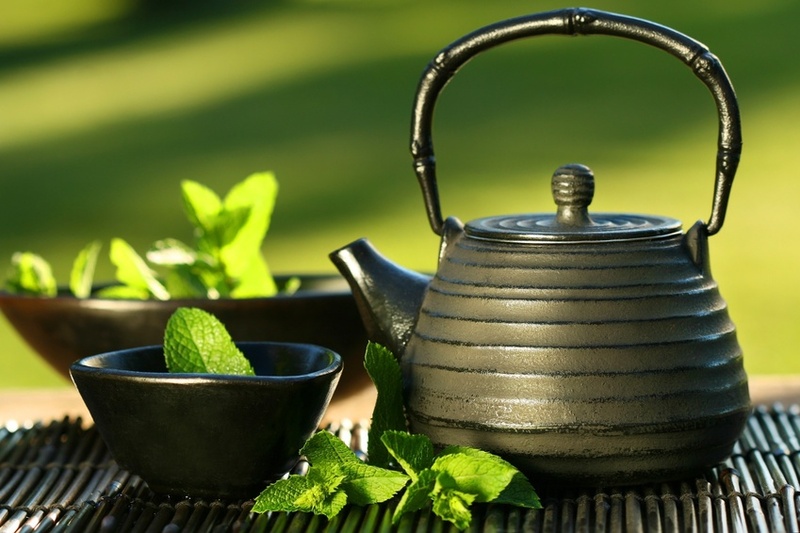 Second to water, tea is the most consumed beverage around the world according to the FDA. Steaming hot or iced, in winter or summer, tea is soothing, refreshing, fragrant and even healing. 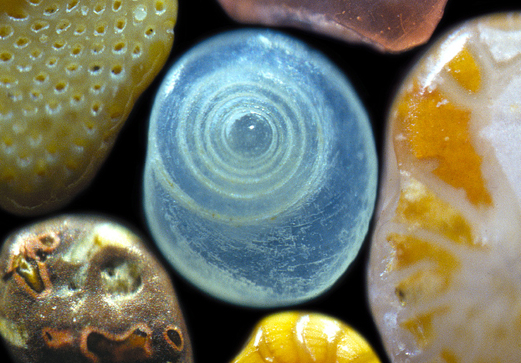 Here you are — enough photographs for two green tea breaks: rain pictures and some of the prettiest caterpillars you'll ever see. 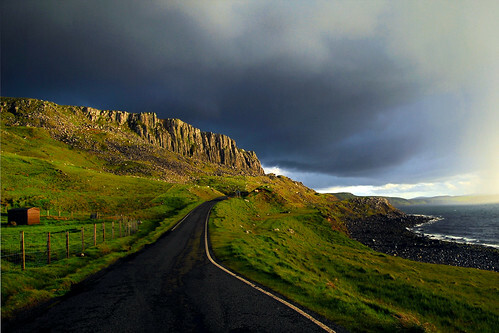 A storm approaching the Isle of Skye. A Flickr user named Okinawa Soba has a huge collections of photos of old Japan. Cutting ice in the days before refrigerators. You can improve your life and live longer by (1) stretching you muscles, (2) improving your outlook and attitude, and (3) striving to get along better with others. 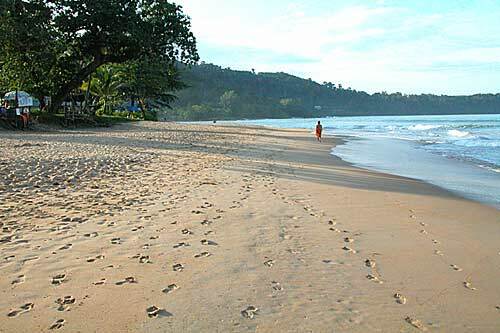 A loose, flexible body is better equipped to stave off stress, too. The Library of Congress has put up an online album of over 1,600 color photos from the 1930s and '40s. 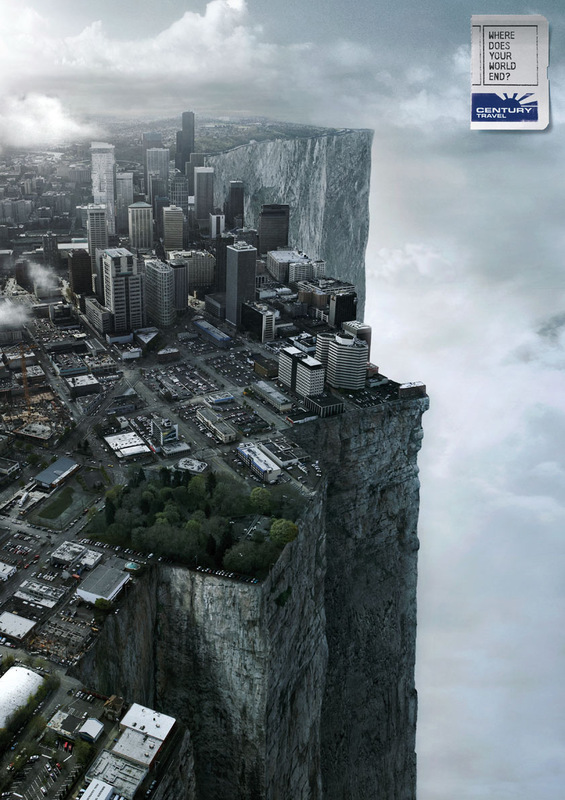 Mental Floss has posted some of the most striking ones. Title: "Shepherd with his horse and dog on Gravelly Range, Madison County, Montana (Aug. 1942). Christine Hunt and Eileen Schley are librarians in Proctorville, Ohio, who share their interest in tea with library visitors. Sosei Matsumoto lives in Los Angeles, where she has trained over three thousand students in the art of green tea ceremony. Sosei Matsumoto in front of her home in Los Angeles, where she teaches Japanese tea ceremony. Some say that the high-dynamic-range (HDR) technique is gimmicky, but there's no denying that when used right, HDR can produce stunning pictures. In this shot, the HDR technique produces an otherworldly effect. Shorpy — "the 100-year-old photo blog" — has a category called "Boats & Bridges." 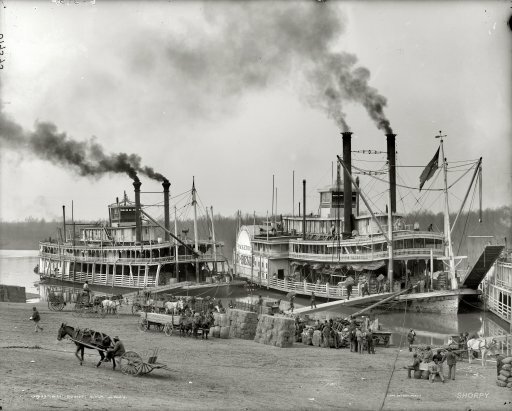 One of my favorite pics there is one of two riverboats called "Old Man River," taken in 1900. 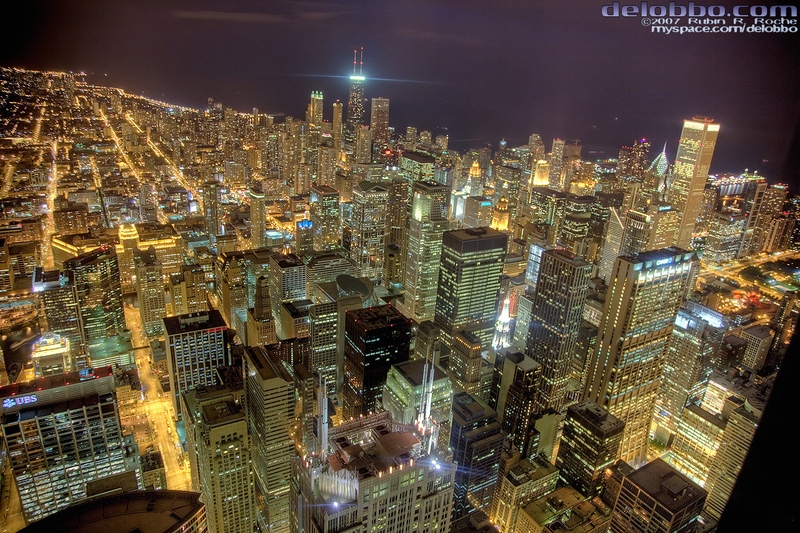 The picture is so large and so high-resolution that you almost feel like you've been transported back in time. I find it strangely relaxing. Click the pic to see the super-extra-large version. Yellowstone Park's Morning Glory Pool. Yaeko Niijima was born into a warrior family that claimed descent from the great 16th century general Yamamoto Kansuke (who was immortalized in a famous woodblock print). The daughter of a gunnery instructor, she helped defend Aizu Castle during the Boshin War. However, Yaeko later learned the Urasenke school of Japanese green tea ceremony, eventually becoming a tea master with her own students. She had first become interested in tea ceremony after working with the mother of Sennosai, the 13th headmaster of the school of tea founded by Sen no Rikyu. During the Russo-Japanese War and World War I, Yaeko served as a volunteer nurse. In recognition for this service, she was presented with a Silver Cup award by Emperor Hirohito in 1928. Was green tea responsible for her transformation from warrior to angel in white? I like to think so. Yaeko Niijima (middle) late in life. 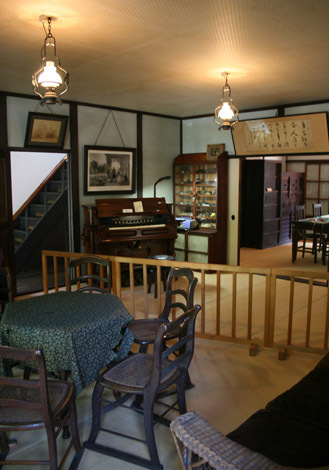 Inside the Niijima residence — which is preserved as a museum today — you can still see the piano that Yae Niijima played. A book of Japanese "life hacks"
Dilemma — The company bowling tournament is coming up, and the winner gets an extra grand in his or her bonus this year. You want it — bad — but right now you can barely keep the ball out of the gutter. Solution — Take an iron — yep, the one you use to press your shirts — to the bowling alley and practice pointing the end of it at the second arrow from the right on the lane as you make your approach. Why this works — This angle positions you perfectly for a dead-center throw. When you repeat this motion with the ball, you get the angle down pat before you factor in the weight and awkwardness of the ball. There is also a series of urawaza videos online. The "Ice Cream Yo-Yo" is an example of an urawaza. 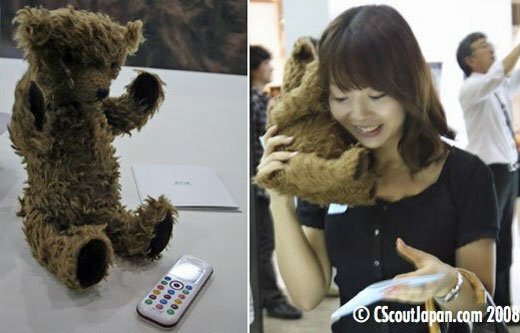 Next time you see someone in public having a conversation with a teddy bear, remember: it could be a cellphone disguised as a teddy bear. If you need to mellow out before tackling the task of a Labor Day barbecue, well have I got some pictures for you — over a dozen beautiful photos of natural beauty across the U.S., courtesy of the talented photographers of National Geographic.